Dan Patrick's radio show this afternoon was very Bonds branded-ball heavy, grabbing baseball HOF president Jeff Idelson on for a few minutes to talk about how they finally wrestled the piece of history away from Marc Ecko. 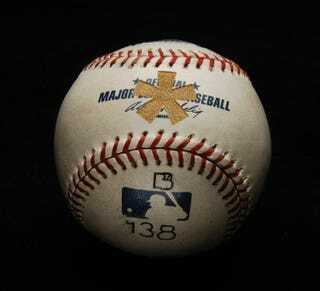 Lucky for them, the HOF was kind enough to send them a picture of the infamous branded hide that once was Barry Bonds' 756th homerun ball in all of its tainted glory. You can spend the rest of the night staring at that ruined ball, dreaming of a better tomorrow, and praying for Chris Snyder. Also, if anyone is not doing anything firework-related and would like to sit inside and watch sports all weekend while writing on this site, please feel free to hit me up. Considering this is the freewheeling managerial style I'm adopting during this transitional period, the chances of you getting paid before 2010 are rather slim. Those who are interested, however, should feel free to drop a line.